Hypnosis and NLP can really help. Binge eating disorder is a pattern of behaviour that affects many people. Whatever the reasons for the existence of this pattern it is possible to help you make changes in the way that you eat by using hypnotherapy and NLP so that you simply stop eating too much food. It often seems that it is simply beyond control, but you can learn to stop binge eating for good. Very often, these binge eating disorder behaviour’s seem to be literally just beyond the conscious control of an individual. We work on multiple levels to help you to re-establish more appropriate eating behaviour. This isn’t counseling, or advice, just practical proven NLP and hypnotherapy to retrain your thinking and your behaviour, to easily stop you losing control. Consciously, we show you HOW to take control of the ‘automated’ thoughts as they arrive in your mind, By doing this you can learn to change these thoughts which in turn have tended to create feelings of desire for food. Then, with hypnosis, we work to help you to re pattern the behaviour at an unconscious level, so that the desire for binge eating simply fades away. We always think it is a good idea for our clients with ‘issues’ around food, whether with binge eating or not, to get professional advice from a qualified nutritionist. This can be arranged either privately or via your GP. Many people do find their experience of learning to stop their binge eating disorder and control their consumption of food (and feeling comfortable within themselves as they do so) a liberating experience. How many sessions will it take to stop my binge eating disorder? By using this combination of hypnotherapy and NLP, we find that, on average, we need to see clients for 2 – 3 hour-long sessions. For those whose problems with binge eating disorder are just part of a more general problem with food consumption we recommend ‘Weight Control’ by Duncan McColl. 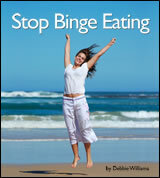 is an excellent self hypnosis recording by eating disorders specialist, hypnotherapist and NLP Trainer Debbie Williams. It is particularly effective in getting people to stop binge eating. By overcoming emotional blockages you will free yourself from binging for good until eating like a naturally lean happy healthy becomes automatic. Well hopefully it will help you a great deal! These food issues are some of my [Steve Tromans] favourites to deal with (I know that sounds weird…) and I have helped many eat better, through the years. We dont all work in exactly the same way so each individual will have their own take on what helps best, and of course it depends upon what is specifically going on for you. Do please feel free to get in touch directly.